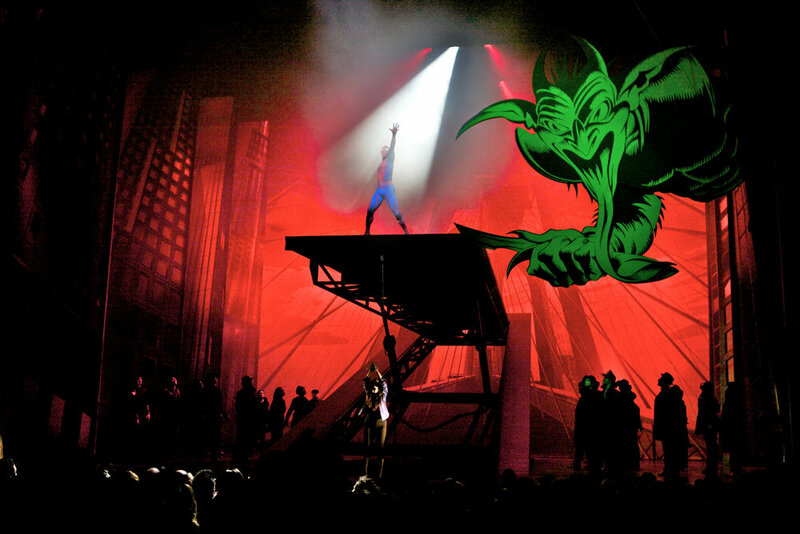 A scene from the Broadway production of Spider-Man: Turn Off the Dark. Berger, you see, was the co-librettist of Spider-Man, and therefore the person best equipped to write a book on how it all went wrong. Unlike the musical’s famous songwriters (Bono and Edge of U2), he’s a regular guy who got in over his head. Unlike Taymor, he made it through to opening night. As an award-winning playwright and TV writer, he’s literally a specialist in storytelling, characterization, and dramatic irony. Well, I’m pleased to say that my wish came true and Song of Spider-Man is even better than I hoped (even if it took me several years to get around to reading it). This is the most page-turning, jaw-dropping, perversely fascinating book I’ve read in a long time. Put it this way: within the span of a single page, you learn that Berger took to posting anonymously on Broadway message boards in defense of his own show (!) and that the director and choreographer tried to convince the stars of the show, 27-year-old Reeve Carney and 19-year-old Jennifer Damiano, to hook up in the hopes that it would improve their onstage chemistry (!!). And there are still 180 pages and 180 previews to go (!!!). Most fascinating of all is the dramatic irony of how life mirrored art. Glen Berger is kind of a Peter Parker figure: a quick-witted nerd who was plucked from obscurity and given “great power and great responsibility.” Meanwhile, what attracted Julie Taymor to this project was the idea of combining Spider-Man’s origin story with the Greco-Roman myth of Arachne, a character she obviously identified with. In Taymor’s vision, Arachne is a powerful, vengeful, misunderstood spider-goddess, a master illusionist and storyteller. At first she serves as a mentor to Peter; there’s even a subtext of unconsummated romance between them. But then, when she thinks he has rejected and betrayed her, she becomes his archenemy. No, Berger’s not a dispassionate narrator—how could he be? He wrote this only a few years after he finally got off the crazy roller-coaster that was Spider-Man, and consequently comes across as an emotional mess. (Though often a very funny and self-deprecating mess.) But then, emotion is the engine of dramatic storytelling. If Berger had waited until he’d fully come to terms with his experience before writing this memoir, it might have been more polished, but also way less compelling. In a sense, that’s what ended up happening to Spider-Man: Turn Off the Dark. After Taymor’s departure, Berger worked with Roberto Aguirre-Sacasa to retool the script, and the final result sounds much more coherent but also much more prosaic. In the end, was it worth all the time, money, blood, sweat and tears? Did the world really need a singing, swinging Spider-Man? I don’t know. But I’m grateful that Berger’s memoir allowed me to be a fly on the wall.